A delicately wobbly, creamy panna cotta is such a simple but sophisticated dish. Infused with the scent of elderflowers and partnered with a sharp gooseberry compote, it makes a stunning summer pudding. Use fresh elderflowers when in season or otherwise elderflower cordial works fine. 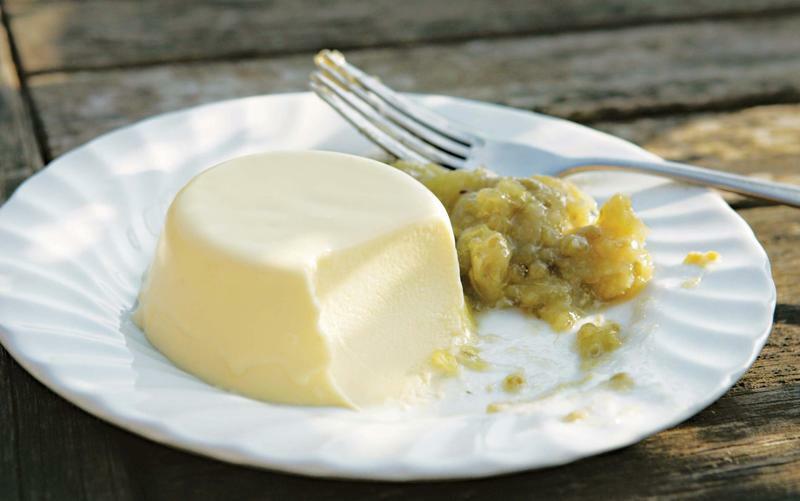 Leave out the elderflower altogether and this is a great recipe for a plain panna cotta, with a little tang from the yoghurt. elderflower heads in a piece of muslin and add to the pan, or stir in the elderflower cordial. Scald the liquid – bring just to the boil, but don’t let it bubble. If you’re using elderflower heads, leave for half an hour to infuse, then remove the elderflower. Soak the gelatine in cold water for 5–10 minutes, until soft and floppy, then squeeze out excess water. If you left the cream mixture to infuse for half an hour, reheat it almost to boiling point – if you have used cordial, the cream should still be hot enough. Add the gelatine to the hot cream mixture and stir until dissolved. Leave to cool to room temperature, stirring from time to time. Once cooled, stir in the yoghurt until thoroughly combined. Pour the mixture into four 125ml moulds, such as ramekins, and chill in the fridge for at least 4 hours, until set. Meanwhile, make the compote. Put the gooseberries in a pan with the sugar and 50ml water. Tie up the elderflower sprigs, if using, in a piece of muslin and add to the pan. Bring to a simmer and cook gently for about 10 minutes, until the gooseberries are soft. Leave to cool completely, then remove the elderflower sprigs and chill the compote. To turn out the panna cottas, dip each mould very briefly in hot water – literally just a few seconds – then turn upside down on to a serving plate and give it a shake; if necessary, run a knife around the edge. Serve with the gooseberry compote.